The mighty Maximum Fun podcasting network may host the entire McElempire, with both MBMBAM and their related shows of which there are roughly a fifty hojillion fold (and I like that, that’s cool), but there is one show I found from an ad in My Brother, My Brother and Me, and it’s Can I Pet Your Dog. Can I Pet Your Dog is almost impressively nothing. 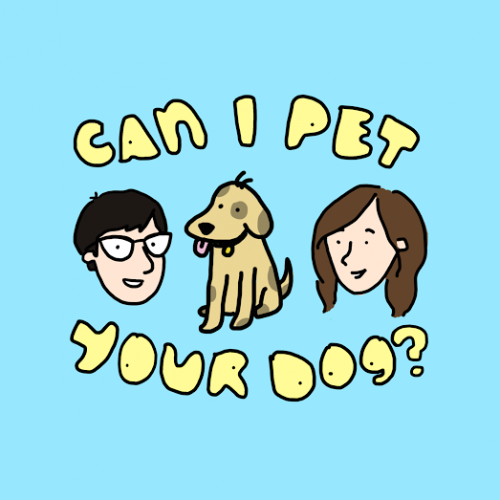 It is a short podcast of two people talking about their dogs (in early episodes, they did not both have dogs). They are not exceptionally or exquisitely funny. I mean, they’re funny, but it’s not uproarious comedy; I don’t find myself quoting it or recommending it (except here, I guess). Can I Pet Your Dog is, however, inoffensive, sweet, and comforting. It is funny without reminding me of gross comedians; it does not feel I’m about to stray into realms of vile jokes or random political stuff about this person or that person and how dare they. It is, when I do find the time to sit down and tune in, a balm of comforting, simple, pleasures of owning a dog.